Guide to Gingham Embroidery … or … errr … Chicken Scratch! Chicken Scratch is such a weird name for an embroidery technique! I can only imagine that it came about because this technique of embroidery on gingham involves sharp little stitches … like chicken’s feet maybe? Or maybe some of the stitches look like the hatch marks in the ground after chickens have been foraging for peckable foodstuffs? Whatever the case, for some reason, the name was used, and it stuck. Gingham Embroidery, gingham lace, snowflaking, and gingham cross stitch are all interchangeable words for “chicken scratch,” and golly – I’d even venture to say they’re somewhat preferable! Chicken scratch makes me itchy. Anyway – to get one with it – summer time is a perfect time to teach embroidery to kids, or to take up a quick project yourself, and gingham embroidery can fill the bill on both accounts. One of my plans this summer is to help keep my niece occupied by making a chicken scratch apron with her. I want to incorporate this drawn-thread-on-gingham technique with the chicken scratch, using a smaller checked gingham. It just so happens that there’s a pretty good e-book available online that teaches step-by-step the methods and variations of gingham embroidery. The book is by Laurie Latour, and it’s called The Guide to Gingham Embroidery: Book One – Stitch & Learn Gingham Lace, Snowflaking, & Gingham Cross Stitch. Though a much more rustic needlework technique, gingham embroidery can be used very effectively to create a lacy design on items made from gingham. My favorite application of the technique is on aprons. Laurie has an extensive collection of vintage gingham aprons embellished with chicken scratch, and she uses a few of them in the book to show the effectiveness of particular chicken scratch techniques. But the useful content in the book is the instructional material. 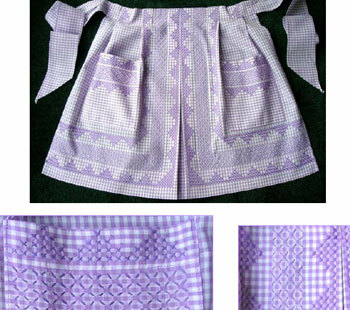 While gingham embroidery is not a difficult technique, it is helpful to have step-by-step photos of the process of making the different stitches and stitch combinations, along with the method of traveling those stitches to minimize the messy back that can often result in this type of needlework, if care isn’t taken. The book includes chapters on supplies, tools and tips, instructions on stitch variations, three simple projects (embroidered book marks, gingham lace tissue box cover, and gingham lace Christmas trees for ornaments and cards), and an appendix with an alphabet chart, a Christmas tree chart, and gingham graph paper (hey, you don’t see that too often!). What I like most about the book is it’s suitability for teaching children. See, gingham embroidery is one of those perfect techniques to use to interest kids in needlework. For one thing, the stitches and variations are easy enough that the child is quickly successful, but the result is complex enough to be visually interesting. For another thing, it’s super-quick to work up, and seeing the results form quickly always spurs kids on to do more. There’s nothing like success to keep a kid interested! So now that it’s summer – and if you’re looking for something to keep your crafty children occupied, or you’re wanting to teach them a skill to keep them occupied through the break – you might consider checking out this e-book on Gingham Embroidery. I’m glad Laurie wrote it. There aren’t a whole lot of books that actually show step-by-step the techniques, probably because in the needlework world, the technique seems so basic. 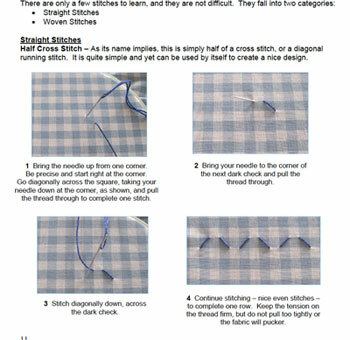 But for a complete newbie to needlework, those step-by-step photos and how-to tips are a terrific way to get started! Update, 2017: Unfortunately, I don’t have a source for this ebook anymore. If I find out where it can now be purchased, I will update this post with a new link. What about you? Any plans this summer (or winter, depending on where you’re located!) for stitching with kids? I’m always on the look-out for kid-oriented needlework ideas – feel free to share yours in the comment section below! How strange!! Here in France, this type of embroidery is called “Swiss embroidery”, and the name of the fabric is called “Vichy”. There is a lady here who wrote a book about it: “La broderie Suisse” by Brigitte RAINGLET. I just wanted to let you know that I love your blogs every day. Your book reviews however, are getting me into trouble. I just ordered the Lefkara Lace book you reviewed a few days ago from Germany. Even though it was half the price of Amazon’s it is still a hefty price and probably my most expensive. I read your wonderful reviews and then I get all excited about doing this new technique. I will keep reading your reviews, but I think I will have to be more careful what I decide to buy. :>)) Thanks for getting me hooked on all these new techniques and bettering myself. I like giving them something small and simple that’s going to look great even if they have a little trouble with it. How sweet and charming these aprons are! I seem to remember my mom having one like this. And totally off topic here, but I wanted to say thanks for the tip on using Sulky’s metallic machine embroidery thread instead of the (impossibly tangly unwieldy) DMC metallics. I wanted to make some shiny stars and a moon on something I’m making for a young grandson, and I think the Sulky threads will work perfectly. This is really huge right now in Italy and they call it “Broderie Suisse”. Hi Mary, I just sent you an email with file attached of a Chicken Scratch test swatch I made. I did not see any other way to send you a pic! Is this the best method? Thanks for your generous sharing, Mary. It would interest you to know that Gingham embroidery is also know as Australian Cross stitch and there are many site on the web covering it. I just ordered the book, thank you. The link you provided didn’t take me to the book but I did a quick search on the site and found it. When I was young I used gingham mounted on a board and then painted a Sunbonnet Sue and used dots within each square to imitate fabric on her dress, so sweet! As far as Summer projects my 9 yr. old daughter and I just ordered a weaving loom and we’re impatiently waiting for its arrival. I’ve also been teacher her how to embroider. We started last winter with redwork and we both love it. Thank you for your site I really enjoy all your enthusiasm and glimpses into needlework that I may have never seen or heard of before! Mary–Thanks for posting. This technique would make a great program for a guild meeting so I spent time last year collecting lots of free designs & tutorials online. I was surprised at the range of motifs, from really simple “folk art” type to some very intricate patterns. At the time, I found more links to Broderie Suisse than chickenscratch. The main problem seems to be the supplies. While I haven’t checked since 2010, a decent selection of 100% cotton 1/4″ gingham was “scarcer than hen’s teeth”! Could recommend a source? I found some 100% 1/4″ gingham and homespun at JoAnn’s recently. Look in the quilt fabric section. I found a bright turquoise that was quite pretty. Also check online. Can you help? I am looking for an alphabet Chicken scratch pattern for ginham. I just went looking for the e book about Gingham embroidery. It was not available at the site that is in you link. I would like to find this as I remember my mother doing a lot of this type of embroidery. I also did a little myself, but it has been so long that I do not remember how to do it. I would also like to have the patterns. Thanks for your help. I love doing cross stich which just recently new is was like broderie suisse. In my country we use linen fabric , piqué, or squared cotton for it. Does gigham fabric has to be pre washed or can I just work on it as it is. I have enjoyed a lot reading here and there but never find a guide about how to manage fabrics. thansks. I am from. Durban South Africa. I have a sewing project for girls from the age 6.Our project for Jan 2019 will be a worksheet for chicken scratching. They enjoy the classes tremendously and so do I.